"The Falcon Band Boosters would like to invite you to our annual Arts and Craft Show. We are excited to offer this event to our unique Lake Cities Community of Corinth, Hickory Creek, Lake Dallas, Shady Shores and surrounding areas. Join us for our Annual Spring Craft Fair. 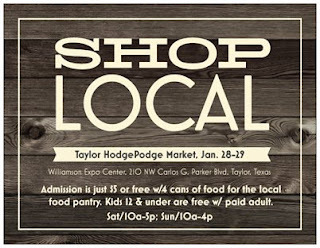 Shop from local vendors featuring handmade gifts, jewelry, crafts, snacks and more." Applications are available here and are due by April 03, 2017. For more information, visit their website or contact their event coordinator at falconbandcraftshow@gmail.com / gingercollier@rocketmail.com. "3rd Annual Craft Fair at Timberview High School, located in S. Arlington. We normally have 300-500 people come out. 40 plus vendors. Free live performances, and kid activities." Admission is $2. 12 and under along with Senior Citizens are FREE. Booths are approximately 10 x 10 for $45. Electricity is included, if needed however the vendor must request it ahead of time. Applications are available here and are due by March 15, 2017. For more information, visit their website or contact their event coordinator at teresatamez@misdmail.org / Office Phone: 682-314-1544 / Cell- 817-371-1708 (txt preferred). "The Girlfriends Wandering Market is a fun and fabulous shopping event showcasing home decor, handmade artisans, boutiques, vintage inspiration & more! Come spend the day and experience the most unique boutiques in town!" Admission is just $7 per person or $5 per person with 2+ cans of food for the local food pantry, kids 12 and under are free with paid adult. Free parking! Includes one 6 ft table and two chairs. Free wi-fi and parking. Electric may be requested, but not guaranteed. "Local community farmers market, located in Historic Mansfield Texas. We offer farm fresh eggs; poultry, beef & exotic meats; seasonal produce; local honey; jams; jelly; plants; arts & crafts." Applications are available here and are due by August 31st, 2017. For more information, visit their website or contact their event coordinator at mansfieldfm@hotmail.com. 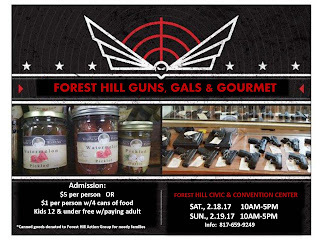 "Booth after booth, indoor and outdoor, of handmade items, unique gifts, a hodge podge of offerings you can't find in the mall...have fun and support local, small businesses!!! Show hours: Sat/10-5; Sun/10-4. Admission is just $5 or free w/4+ cans of food for Shepherd’s Heart Food Pantry. Kids 12 and under are free with paid adult." "St. Philip Preschool and Parent’s Day Out will be hosting the Annual Spring Arts, Crafts & Business Fair and Silent Auction on Saturday, March 4th, 2017 from 10:00 a.m. – 4:00 p.m. New this year will be carnival games for the kids! The annual fundraising event will feature over 40 vendors, a bake sale, concessions and the chance to bid on hot ticket items in the silent auction. Popular items up for grabs include vacation stays in Orange Beach, Ala., Red River, N.M., and Pagosa Springs, Colo., a family pass to the NRH Centre, NRH20 tickets and a variety of local restaurant and store gift cards. All proceeds from this event will support the school’s educational programs. The event will be held at St. Philip Presbyterian Church 745 W. Pipeline Rd. Hurst, TX 76053. For more information, contact Cindy Baren at 817-282-0557." Booths are approx 8 X 10 and cost $75. Booth may be shared between 2 vendors. Electricity is $15. Vendor provides tables & chairs. Applications are available here and are due by March 1, 2017. For more information, contact their event coordinator at cindyb@stphil.org / 817-282-0557. "An all day event featuring a variety of vendors, food trucks, raffle and silent auction. Something for everyone!" Vendor must bring own tables. Chairs and electricity available for additional fee. Applications are available here and are due by February 28th, 2017. For more information, visit their website or contact their event coordinator at mollyfawkes76@gmail.com. "Looking to browse Boutiques, handmade home decor and candles, jewelry, vintage and pet items, plus more of your favorite products all under one roof? Join us for our February event! We'll have Live Music, gourmet pecans, and Girl Scout Cookies too! This event is indoors, so weather is no worry! Plenty of parking, which is Free. Entry is Free too!" For more information, visit their website, facebook page, or contact their event coordinator at info@forneytrade.com. "Booth after booth of gifts, food, shabby chic/vintage, original art, crafts and more!!! Admission is $5 per person or $4 per person and 2+ cans of unexpired food for the McKinney Community Food Pantry. Kids 12 and under are free with paid adult." Admission is $5 per person or $4 per person and 2+ cans of unexpired food for the McKinney Community Food Pantry. Kids 12 and under are free with paid adult. "Jump start your New Year's Resolution to get healthy! 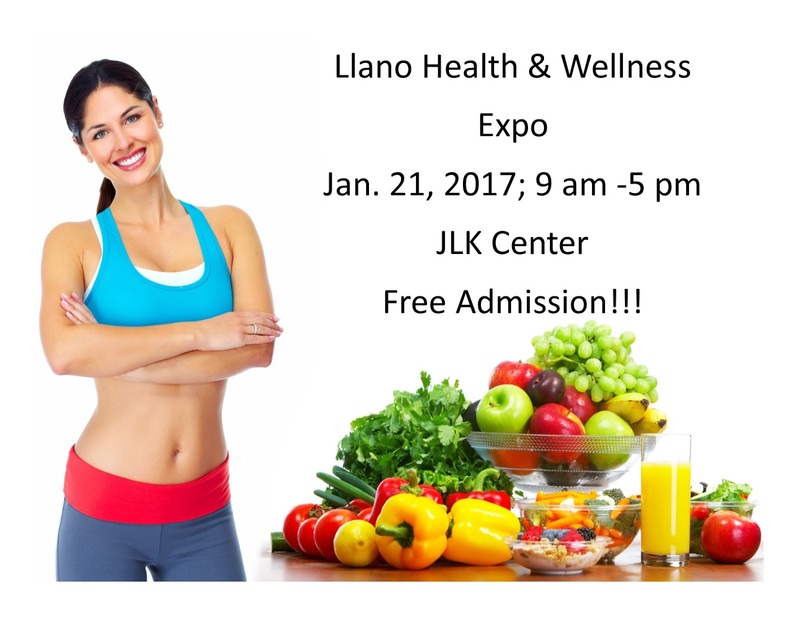 Stop by the JLK Center on Sat, Jan. 21, from 9 am to 3 pm, to learn about great weight loss options; find great deals on workout gear; how to use essential oils and so much more!" Admission is free! All kids under 14 must be accompanied by an adult. 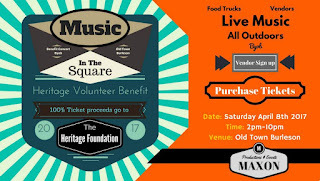 "Music In The Square 'Heritage Volunteer Benefit' is dedicated to the men and woman that graciously volunteer every day to preserve and create awareness of Burleson's history. This Country Concert Benefit will be in their honor and will receive 100% of ticket sales.We have teamed up with the City of Burleson to make this a great event! There will be a huge stage with live bands playing throughout the event. The lineup is TBA." Admission Fee: $5 adult admission, 12 and under are FREE. 100% of ticket sales will go to the Heritage Foundation. Booths are 10x10 - $100.00. Applications are available here and are due by April 01, 2017. For more information, visit their website or contact their event coordinator at maxonproductionandevents@gmail.com. "Something for the entire family!!! 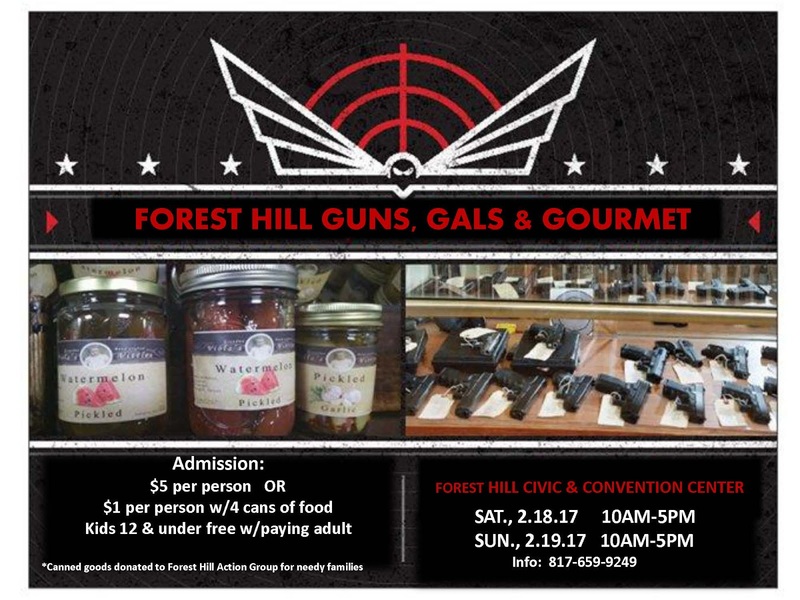 Guns, ammo, knives...boutiques, food...support small business and have fun too!!! Admission is $2 per person or free with 2+ cans of unexpired food. Kids 12 and under are free with paid adult." Admission is $5 per person or free with 4 cans of food. Kids 12 and under are free with paid adult. Gun tables (for guns, knives, ammo only) are $65 each. "Spots are all-inclusive, available for $40.00. All funds are going towards a mission trip to Tennyson Children's Center in Denver, Colorado. Event will be held at Azle Christian Church in Azle, Texas. If there are any questions, please contact Logan Fraser." Booths are 10 X 10 and cost $40.00. Tables are first come first serve and electricity is available. Applications are available here and are due by March 1st, 2017 February 1st, 2017. For more information, visit their website or contact their event coordinator at azleccyouthminister@yahoo.com / 254-447-2520. "Are you a junk foodie? Health foodie? Fingerfood foodie? We have a day for you!!! Booth after booth of food!!! 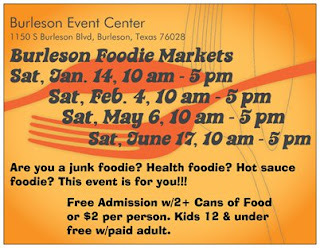 Salsas, jams, jellies, BBQ...sample some great food offerings!!!" Admission is free w/a canned food donation of 2+ cans per person to benefit the Golden Food Pantry, or $2 per person without a food donation. Kids 12 and under are free with paid adult. "We've moved! Stay warm and toasty as you shop our massive new indoor venue! Boutiques, crafters, pampering products, wax & warmers, delicious pecans, accessories for your favorite fur babies, and so much more to see!" "FUNKY JUNK ROUNDUP is a one day shopping extravaganza featuring a unique blend of vintage finds & inspiration, one of a kind handcrafted items, antique décor, hand painted furniture, repurposed items, rusty-chippy-shabby-reloved & refunked JUNK, bling & glam boutiques, sparkly jewels and FABuLOUS JUNKTIQUES for your creative soul! Put some JUNK in your trunk™ Y’all!" "Are you a junk foodie? Health foodie? Fingerfood foodie? We have a day for you!!! 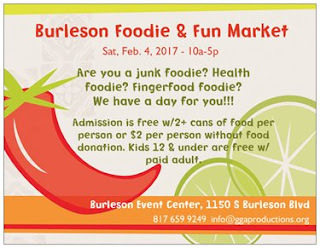 Burleson Foodie Market--Booth after booth of food!!! Salsas, jams, jellies, BBQ...sample some great food offerings!!! We also have some awesome non-food vendors offering everything from hand crafts to boutique items and more!!! Admission is free w/a canned food donation of 2+ cans per person to benefit Burleson's Harvest House, or $2 per person without a food donation. Kids 12 and under are free with paid adult." Admission is free w/a canned food donation of 2+ cans per person to benefit Burleson's Harvest House, or $2 per person without a food donation. Kids 12 and under are free with paid adult. "Come join us for our 30th Annual Balloon Festival in Highland Village, TX! There will be crafts, tethered balloon rides, Hot air balloons, 5K run, entertainment, Kid Zone, Classic Car Show, food vendors, and much more! FREE family fun!" Intersection of FM road 407 and Briarhill Blvd. Admission Fee: No admission charge, asking for $5 donation for parking. Booths are 10 X 10 and cost $200. Each additional space is $200. Electricity provided at no cost. Vendors to provide extension cord, text, chair, tables, etc. Applications are available here and are due by August July 01, 2017. For more information, visit their website or contact their event coordinator at hvballoonfest17@gmail.com.